Home › Architectural Research › Six Years: Does this mean you hate it, Miss Ada Louise? Six Years: Does this mean you hate it, Miss Ada Louise? As we celebrate the Sixth year of existence for Misspreservation.com we look back on some of our favorite and poignant posts. 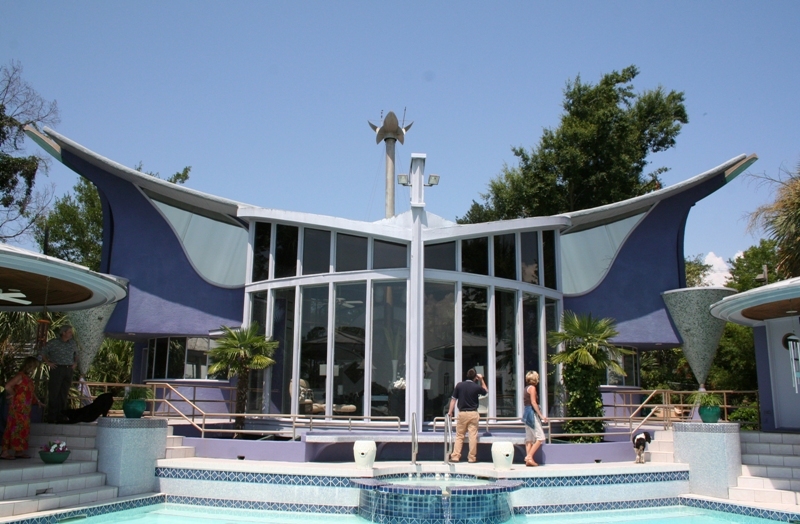 This post originally debuted in January of 2010, fifty years after the construction of the Bruce Goff-designed Gryder House in Ocean Springs. With the lazy days of summer coming up, this post mentions two good reads. Paul Goldberger’s On the Rise and Ada Louise Huxtable’s On Architecture: Collected Reflections on a Century of Change. Goldberger’s book is a collection of articles from the beginning of his career at the New York Times. I found it to be a quick, easy and enjoyable read that covers architecture but also the preservation movement during the 1970’s & 1980’s. Ms. Huxtable’s book has been on my to-read list for a while. At some point this summer you’ll be able to find me reading it with my toes in the Mississippi Sound. Until I have that chance to pick up a hard copy, I’ll content myself with Malvaney sticking up for Mississippi’s handsome Goff masterpiece. Does this mean you hate it, Miss Ada Louise? I took the opportunity over the holidays to get back into my reading schedule and finish books that I had started during the dog days of summer. One of those was Ada Louise Huxtable’s recent compilation of her decades of essays as architectural critic with the New York Times and more recently with the Wall Street Journal. The book is called On Architecture: Collected Reflections on a Century of Change, and I highly recommend it for its concise yet visually oriented language and clearly argued opinions. Last year, I read Paul Goldberger’s On the Rise, and I found I like this type of book because it gives me a good feel for how buildings were viewed in the moment, not with years of hindsight and comparative research to change opinions. Bruce Goff is a phenomenon, part of an indigenous American tradition of the unspoiled, romantic, land-loving loner that the [Architectural] Review has labeled the American grassroots mythology. This fascinates Europeans and embarrasses Americans. The architects who complete their concrete and steel bank buildings with hard-edge abstraction are made a little uneasy by a man whose tastes run to rusticity, orientalia, peacock feathers, and pink plastic. When he is published by American architectural periodicals, the tone is uncomfortable and ambiguous (p. 300). The Price House, a chef d’oeuvre of untrammeled, sybaritic fancy in gold-anodyzed aluminum, nylon-carpeted floor and walls, goose feather ceilings, and hanging plastic ‘rain,’ is super-G0ff. Lesser-Goff or pure disaster can be seen in the realization of the sketch for the 1960 Gryder House in Ocean Springs, Mississippi. Here execution turns impossible flying curves into chewing gum and a precisely poised inverted cone into Dairy Queen (p.301). Not just “disaster” but “pure disaster”? Hummfff! I guess I’m just not enough of a critic (I remember Robert Ivy’s comment in his SESAH keynote that the house might be “hard to love”), but I love love love the house, and I frankly don’t really understand what turning “flying curves into chewing gum” has to do with anything. Perhaps Huxtable herself falls into the same class in which she places modernist architects: uncomfortable with the sheer relish, the whimsy, the fun, Goff shows in his buildings, including the Gryder House. Eastern architecture critics may not like that mid-America, and particular Deep South states, might be perfectly comfortable with whimsical fairylands, buildings that seem only childish to minds that (to themselves) are more sophisticated. I wonder if Huxatable still considers the Gryder House a disaster 40 years later, or if her opinion would change if she actually visited the house? I’m glad that the house has owners who love it enough to repair it after Katrina flooding, and while I hope that the architectural establishment comes around, I guess really it’s Mississippi’s house and we can love and treasure it if we want to, chewing gum or not. To view the post as it originally appeared in 2010 click here. I happened to be driving through an older neighborhood a few days ago and noted how many gorgeous mid-century modern houses were there and how I view them through different eyes than when I was growing up with them. Then, there is Ole Miss putting another columned facade on the previously stand-out mid-century education building. Ho hum. :) The mid-century modern art building will probably be next. Sounds like we need to start a support group. PAARMM? 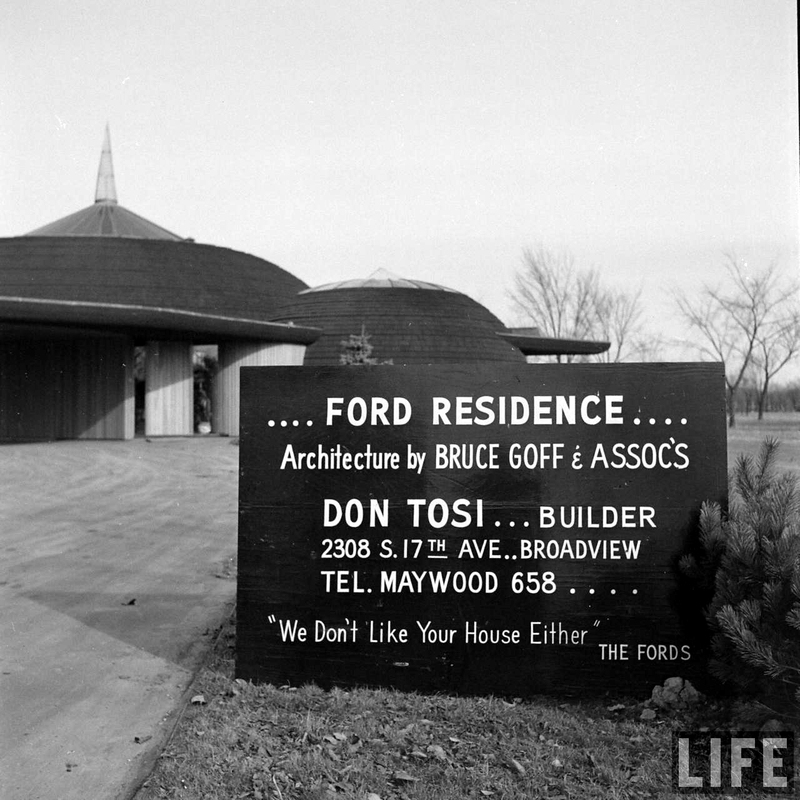 People Annoyed At Remuddled Midcentury Moderns? I’m open to other name suggestions. We can advocate the simple fact that a building can be sophisticated and stately without columns. Not seeing that happening up here, TR. Everyone drank the white column Kool-Aid. How can you not love the Gryder House? It doesn’t compute. It looks like it should be in Los Angeles, CA! Beautiful. It’s cool to see people take aesthetic risks like this outside the East/West coast metro areas. Goff’s patrons in Aurora, Illinois had my favorite solution to the negative reaction. I’m always reminded of a CBS Sunday Morning story on the old CEO of Cummins Diesel, J.Irwin Miller and his big project up in Columbus, Indiana. Always curious and surprised to see slightly modern architecture or outright whimsical buildings outside of big cities. What a feast for the imagination to think if Mississippi’s homegrown modernist had a benefactor like Mr. Miller. Oh the buildings we might have! Our group of hippie happies used to make sojourns to the “spaceship house”, as we called it, regularly, in the ’70s. One of us finally had the gumption to go up and ring the bell– but then he chickened out and ran! It’s a “dream of a Lambinet [in this case, modernist] landscape”, as Henry James described the French countryside. Visiting it qualifies as a drug-free LSD trip. This is a house Salvador Dali might have lived in.